Our friend Tom the turkey heard that Thanksgiving is coming soon and for some odd reason he has decided not to stay for dinner! This stamp just cracks me up! 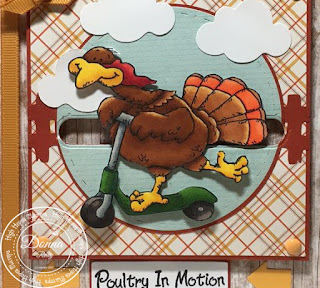 This week's card features Turkey Getaway and the Poultry In Motion sentiment from High Hopes. 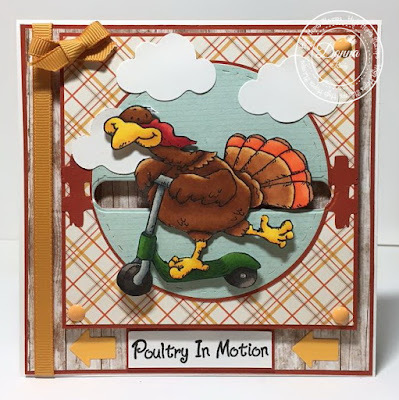 I made him into a slider card.......I mean he does seem to be in a hurry to get out of town after all! After giggling through colouring my stamp I hand fussy cut him out and set him aside. I cut out the "sky" using a stitching and piercing mark circle die and added some die cut clouds. Next I used my slider die to cut out "Tom's" getaway path. I added a fence behind my sky, and added all of this to paper from Echo Park. Some ribbon, a couple arrows and some gumdrops finish off my card. This just cracks me up!! Awesome idea and your colouring is gorgeous! This is even better in person!! great card from another Canadian!